This house was the last acquisition by the Trust in this area to complete the ownership of the corner bounded by Aldwark and St Saviour’s Place. The property was built as a Manse to the former Wesleyan Methodist Chapel, now Nos. 60 and 62 Aldwark, attached at the rear. It is of three storeys, three bays but only one-room deep comprising one room either side of a central entrance hall and staircase. The front retains the original doorway with a semi-circular fanlight rising into an open pediment. At the eaves is a timber block cornice. The interior retains many of the original fittings, all quite simple. The staircase has open strings and turned balusters with square knops. 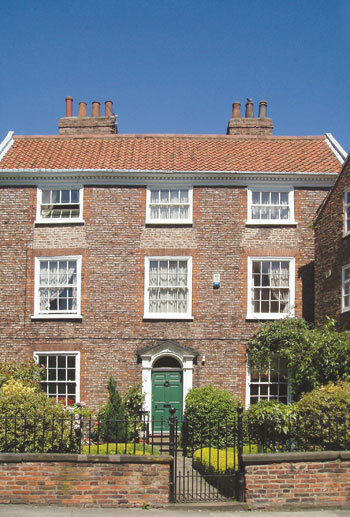 The house is set back in a front garden enclosed by railings which is a rarity in inner York. The unit was purchased from the University of York who had used it as student accommodation and required the minimum of restoration. The dado height panelling was repaired and a new kitchen fitted and the boarded up fireplaces opened. This revealed the original fireplaces all in first class condition and all different in design. These were cleaned and restored and make a very attractive feature to the property.